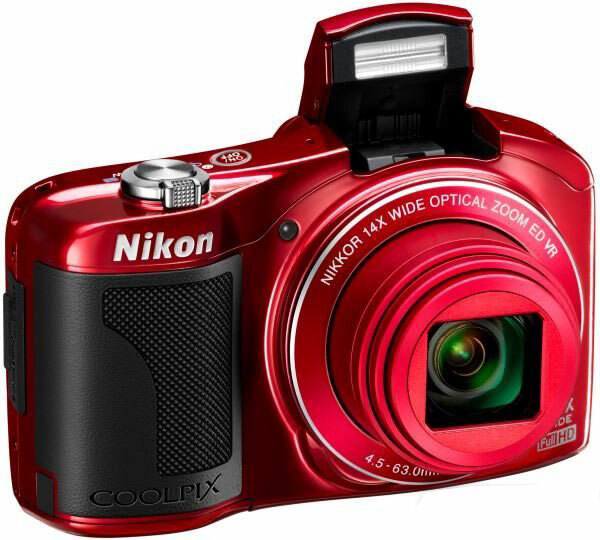 Nikon has launched the COOPLIX L610 - a mid-range camera with a 16 mp CMOS sensor. It boasts of 14x optical zoom with lens shift image stabilisation to reduce blurring due to camera shake. The back-illuminated imaging sensor, with support for up to ISO 3200, means better low-light performance (at least on paper). In addition to still photography, the camera supports Full HD (1080p) movie recording. It features the EXPEED C2 image-processing engine, which reduces lag and waiting time. Macro mode enthusiasts will love the fact that the COOLPIX L610 can shoot objects as close as 1 cm from the lens. Number of effective pixels: 16.0 million. Image sensor: 1/2.3-in. type CMOS; approx. 16.79 million total pixels. Lens: 14x optical zoom, NIKKOR lens. Focal length: 4.5-63.0 mm (angle of view equivalent to that of 25-350 mm lens in 35mm  format). Focus range: [W] - Approx. 50 cm (1 ft 8 in.) to infinity, [T]: Approx. 1.0 m (3 ft 4 in.) to infinity Macro mode - Approx. 1 cm (0.4 in.) (wide-angle position relative to the triangle mark) to infinity (All distances measured from centre of front surface of lens). Display: 3", approx 460k-dot, TFT LCD with anti-reflection coating and 5-level brightness adjustment. Storage: Internal (approx. 28 MB), SD/SDHC/SDXC memory card. File system: DCF, Exif 2.3, DPOF, and MPF compliant. Movies: MOV (Video: H.264/MPEG-4 AVC, Audio: AAC stereo). Image size (pixels): 16 megapixels (High) [4608 x 3456(fine)] 16 megapixels [4608 x 3456] 8 megapixels [3264 x 2448] 4 megapixels [2272 x 1704] 2 megapixels [1600 x 1200] VGA [640 x 480] 16:9 [4608 x 2592]. Shooting Modes: Easy auto, Scene (Portrait, Landscape, Sports, Night portrait, Party/indoor, Beach, Snow, Sunset, Dusk/dawn, Night landscape, Close-up, Food, Museum, Fireworks show, Black and white copy, Backlighting, Easy panorama, Pet portrait, 3D photography), Special effects, Smart portrait, Auto. Continuous Shooting: Single (default setting), Continuous (about 4 images at a rate of about 1.9 fps when Image mode is set to 4608 x 3456), BSS (Best Shot Selector), Multi-shot 16. Movie: HD 1080p(fine) (default setting): 1920 x 1080/approx. 30 fps, HD 1080p: 1920 x 1080/approx. 30 fps, HD 720p: 1280 x 720/approx. 30 fps, iFrame 540: 960 x 540/approx. 30 fps, VGA: 640 x 480/approx. 30 fps, HS 60 fps: 1280 x 720, HS 15 fps: 1920 x 1080, Wind Noise Reduction. ISO sensitivity (Standard output sensitivity): ISO 125-1600, ISO 3200 (available when using Auto mode). Exposure control: Programmed auto exposure and exposure compensation (-2.0 - +2.0 EV in steps of 1/3 EV). Shutter: Mechanical and CMOS electronic shutter. Speed: 1/1600-1 sec, 4 sec (when scene mode is set to Fireworks show). Range: 2 steps (f/3.3 and f/6.6 [W]). Flash: Built-in TTL auto flash with monitor preflashes. Interface: Hi-Speed USB (MTP, PTP). Video output: NTSC and PAL. HDMI output: Auto, 480p, 720p, and 1080i. I/O terminal: Audio/video (A/V) output; digital I/O (USB) HDMI mini connector (Type C) (HDMI output). Power sources: LR6/L40 (AA-size) alkaline battery x 2 FR6/L91 (AA-size) lithium battery x 2 EN-MH2 rechargeable Ni-MH battery (available separately) x 2 AC Adapter EH-65A (available separately). Battery life: Still pictures - Approx 120 shots (alkaline batteries), 470 (Li-ion batteries), and 330 (EN-MH2 batteries); Movies - Approx 11 min (alkaline batteries), 1 h 20 min (Li-ion batteries), and 50 min (EN-MH2 batteries). 4.3" (w)x 2.7" (d)x 1.4" (34.1 mm) (h) (excluding projections); 240 g (including batteries and a memory card). Supplied accessories: Camera strap, LR6/L40 (AA-size) alkaline batteries (x2), USB cable UC-E6, A/V cable EG-CP16, ViewNX 2 CD, Reference manual CD. The Nikon COOLPIX L610 is available in black, red, and silver, and it comes with freebies including a carry pouch, a 4 GB SD card, rechargeable batteries, and charger. The price - Rs 14,000- sound good, and it comes with a year's warranty. Overall, this camera seems to be a good travel zoom option for the coming holiday season.